Oculus (Facebook) announced its new affordable VR headset, the Oculus Go. This $199 device will launch early next year for $199 and Facebook hopes that this will be a step towards its goal to get one billion people to use its VR products. One of the ways that Oculus used to lower the cost of to Go headset is to switch from an OLED to an LCD. 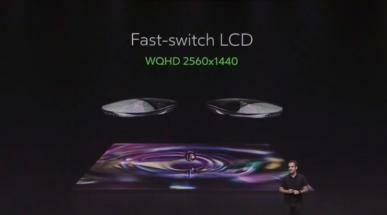 Oculus says that this is a "fast-switch LCD". It's too early to say how this display will compare to the current OLED used in the Oculus Rift. Looking at the slide above, it seems that the Go uses a single 2560x1440 LCD. Oculus isn't the only VR headset maker that is moving to LCDs. A few days ago Valve released some of its IP hoping to get more hardware makers to adopt its platform - and Valve said that advances in LCD technology make it viable as a VR headset display.